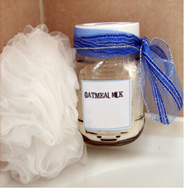 An amazing skin soothing and softening bath product. Effective for eczema, psoriasis, chicken pox, measles etc. Grind lavender essential oil carefully into ½ cup full cream milk powder ensuring no lumps of oil. Then combine all ingredients thoroughly. Place in an attractive glass bottle or jar. Use approximately ½ cup per bath or more if desired.